Realistically, Fox's interpretation of the comic book series Lucifer shouldn't work. It's really only the loosest variation on the story, focusing entirely on the "devil takes a vacation and opens a bar in LA" plot, and turns it into a pseudo-crime procedural with supernatural elements. But it does work. It works indeed. And a big part of the reason it works is Lucifer himself: Tom Ellis. 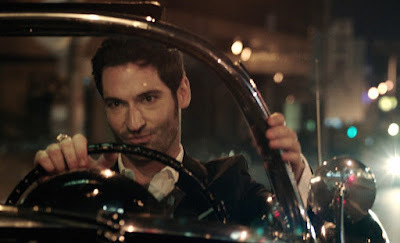 He is a charming, sensual, unnerving devil, and if there were such as thing as Satan, I'd bet dollars to donuts he'd look just like Tom Ellis.